A lone cassette tape is in a room in a derelict. A spectral hand, with an ungodly blue aura, picks the tape and puts it in a boombox. The tape starts and suddenly, the once derelict shines golden and becomes a luscious room, where an unknown person feverishly twiddles the knobs of sequencers and synthesisers. There is an audience looking at the person. A banner above the contraptions reads Dissolved and several rows of tapes are stacked together, forming the words The Amber Surrealizations. A steady beat, like a late 90s dance track with ambient noises (from field recordings) is blasting. One of the tapes is out of the boxes, but the name is unreadable, as it has a ‘scratched out cassette label’. A LED display shines and the mood in the room changes. Still looking luscious, the sounds now bend and glitch. The audience stands in unison and sways in a tribal manner. The LED display reads ‘Shroud of maps’. Is it a movement? It’s unnerving and from time to time, it all goes dark and a disembodied voice narrates as the church organ sounds sound but distort into a glitchy oblivion. The room turns upside down and a rather posh voice starts to ramble. The audience is now hanging upside down and all wearing Gothic clothes. It has suddenly turned into a very industrial affair and the genre-less tune is discomforting but pleasing. The aura around the spectre is now turning golden, a chiaroscuro contrast to the dark atmosphere. The room returns to its abnormal normality and conversations about ‘The dark tourists’ that once disappeared in front of a ‘Menagerie of Empaths’ is the intertwined conversation that makes the spectre glow the brightest. Empathy. A word long forgotten and sometimes misused. It brought a feeling of catharsis. It brought happiness, even if now the sounds were more akin to the unnerving sense of dread in an unknown cave than a walk through a park in Spring. The spectacle continues. There are several glitches in the machine, some brutal like arachnids dancing in formation in a USB, others abstract like the sounds of a television being degaussed. All the sounds, bizarre and strange, have transfixed the emotions of a spectre that no longer felt any. The voices lead to exploding sounds. The person manning the synths is now going wild, shining like a star going Supernova, losing one digital particle at a time, unravelling in an arpeggiated manner until the last particles go out like the last bits of a silver sparkler. What was this spectacle? Field recordings, ambient music, dance sequences. It was a strange performance. A hissing sound starts to increase. The tape runs out. The entire place falls into ruins again and the spectral hands fades into oblivion. Dissolved Soundcloud. Tumblr. Reverbnation. Facebook. Website. Bandcamp. Last.fm. 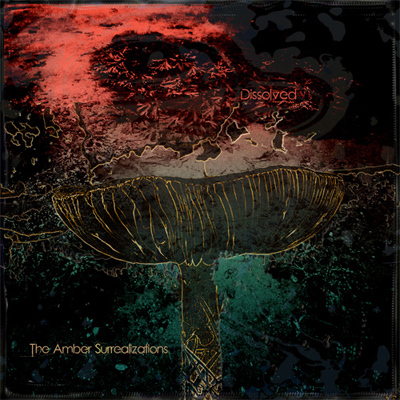 Posted in Ambient, Electronica, Experimental, reviewsTagged Abstract, Ambient, Dissolved, The Amber SurrealizationsBookmark the permalink. Brilliant. All reviews should be written while on mushrooms. No mushrooms required, it’s all 100% natural madness!